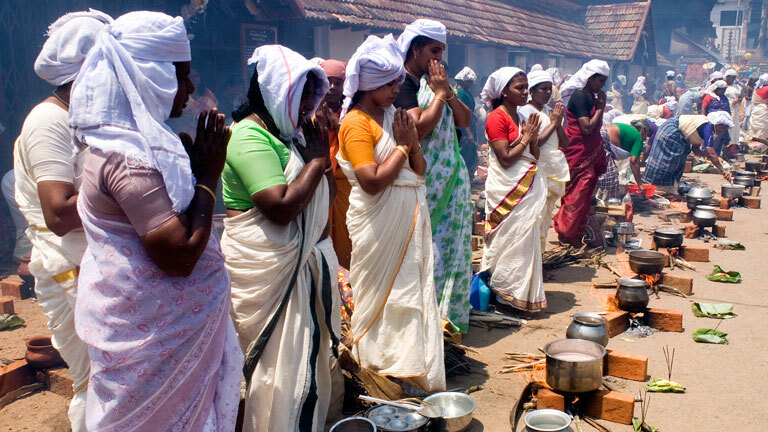 A festival that entered the Guinness records for being the largest single gathering of women for a religious activity, Attukal Pongaala of Attukal Bhagavathy temple in Thiruvananthapuram district is a phenomenon of sorts. The pongaala takes place on the ninth day of the festival that takes place in the Malayalam months of Makaram / Kumbham (February / March). The ritual starts with an offering to Lord Ganapathi. Flattened brown rice, roasted white rice, betel leaf, areca nut, banana, jiggery, flower, incense, traditional lamp, bowl of water, rice measuring vessel are used as part of the pongaala ritual. The hearths of devotees are lighted only after the one inside the temple is lighted. The offerings include white rice, deserts made of jiggery and rice and theraly (a sweet made by steaming) and manda puttu. The pongaala will come to a conclusion with the sprinkling of holy water by the temple priests on the offerings prepared by the devotees.